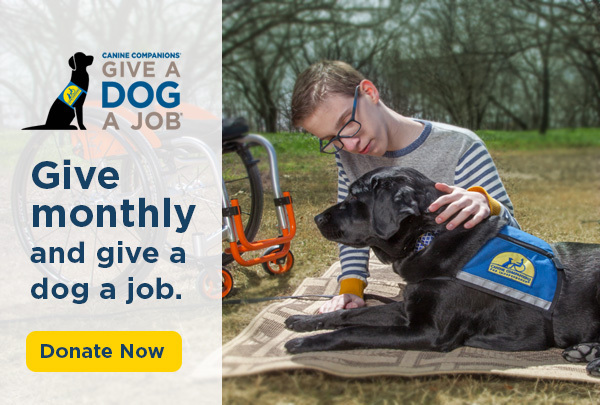 Trevor attended a two-week Team Training to be matched with his service dog, Dray. Trevor realized how wonderful it was to not only be paired with an expertly-trained service dog, but also to become part of the Canine Companions community. “I had no idea I would get a whole ‘village’ when I was matched with Dray,” Trevor explains. Read Trevor and Dray's story in the spring edition of "The Companion." A series of unfortunate events and poor decisions led Erin to prison, but puppy raising is what set her free. “To get unconditional love from a dog, and to have kind, nonjudgmental people respect my opinions and listen to my input, made me feel worthy. It made me feel like a person.” Read Erin’s story. Whether you prefer “The Companion” magazine in print or in this electronic version, we want to hear from you! 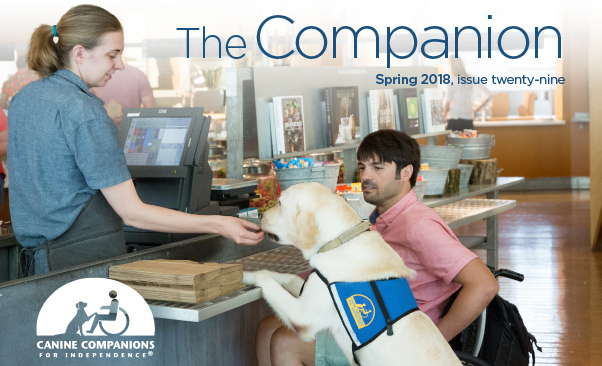 Help “The Companion” magazine be the best it can be, and you'll be entered for a chance to win a Canine Companions gift basket, valued at $150. Click here to complete the survey by May 4, 2018. More Stories From "The Companion"